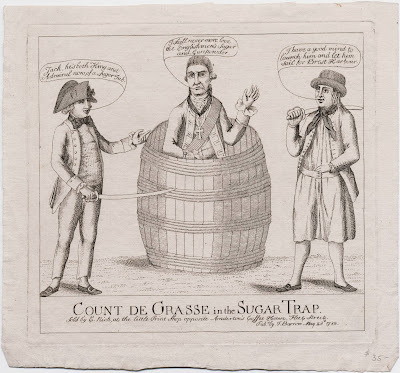 Count De Grasse in the Sugar Trap, by J. Barrow, 1782, Lewis Walpole Library. 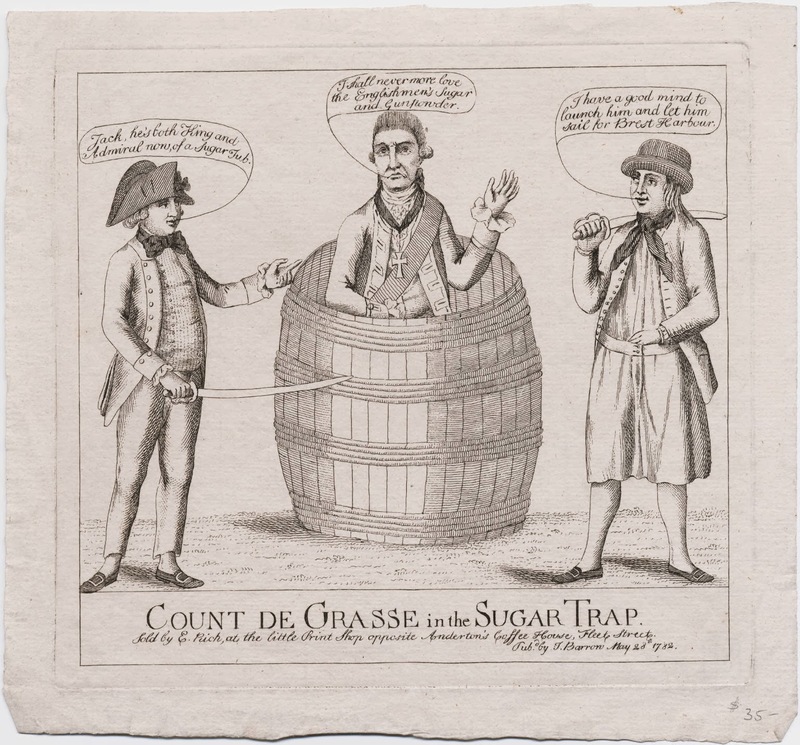 In this political cartoon, the French admiral Count de Grasse is trapped in a sugar cask and verbally skewered by a British officer and sailor. Each of them is armed with a cutlass and a smile. On the right stands a sailor with the cutlass slung over his shoulder. His hat is either a knit cap or a round hat, though it is difficult to be certain. The sailor's hair is just past shoulder length and fairly unkempt. His jacket ends at the top of the thigh, a bit longer than most other sailor's coats. It is single breasted with slash cuffs and waist pockets. The mariner wears no waistcoat, but the black neckcloth covers the part from his collar. Unlike many other slops, this one is fitted with two buttons at the waist, but it's the average length: ending right below the knees. His stockings are white and his shoes are rounded toe. The buckles are rectangular. It's a bit odd the way he rests in his hand, with a few fingers just inside the waistline. This fits with later images of sailors and other laborers of the nineteenth century in a similar posture.